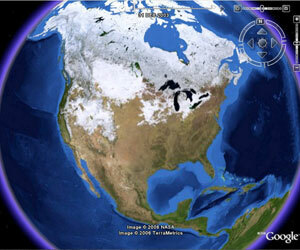 Google has taken Google Earth release 4 out of beta as final with Google Earth version 4.0.2722. Google Earth a free downloadable virtual globe software program presents 3D model or representation of the Earth or other planet by mapping the entire earth by superimposition images obtained from satellite imagery, aerial photography and GIS over a 3D globe, and allows user to freely move around in the virtual environment by changing the viewing angle and position. Version 4 of Google Earth features rich 3D rendering of terrain and buildings. Come built-in into Google Earth is high-quality terrain data and contents for many mountainous regions, as well as rich 3D renderings of famous places. The latest version of Google Earth also supports “textured” 3D buildings which makes the image more lively and more real. Google Earth 4 also features expanded use of .KML (Keyhold Markup Language) or .KMZ (compressed format), the Google Earth file format. KML or KMZ are the Extensible Markup Language (XML) files used for modeling and storing features in Google Earth and Google Maps, and with them, users add and share geographic information in Google Earth, with additional ability to upload photos via GPS, overlays of your own imagery, or large geographic data sets, and can time-stamp the data to create an animations based on time lapsed. Users are encouraged to use Google SketchUp create rich 3D renderings of buildings or sketch figures on the imagery for richer annotations as KML or KMZ files and share them as overlays on Google Earth. The graphical user interface (GUI) of Google Earth also been changed to a much simpler and sleek interface, where navigation is easier, and data layers become easier to find and to toggle on and off. Other than on-program interface, Google Earth website also has a face lift with highlight on the new default layer for 3D textured buildings. There is now Google Earth product comparison that shows you what is the differences between Google Earth, Google Earth Plus and Google Earth Pro. Download Google Earth 4. Google Earth is available for Windows, Linux or Macintosh edition. It’s also available as part of Google Pack (if you don’t unselect it).